I love pastry. Just think of all the wonderful things it has given us, in its various forms: pie, quiche, pasties, éclairs, tarts, Danish pastries…it truly is one of the greatest things in the world. Last weekend I found myself with an abundance of ready-made puff pastry, already defrosted and about to go to waste if I did not take it home immediately and help it fulfil its culinary destiny. How could I live with myself if I failed to help? So, I went on a bit of pastry extravaganza. Generally speaking, I prefer making my own pastry, especially shortcrust. My freakishly cold hands make me an ideal pastry-maker! 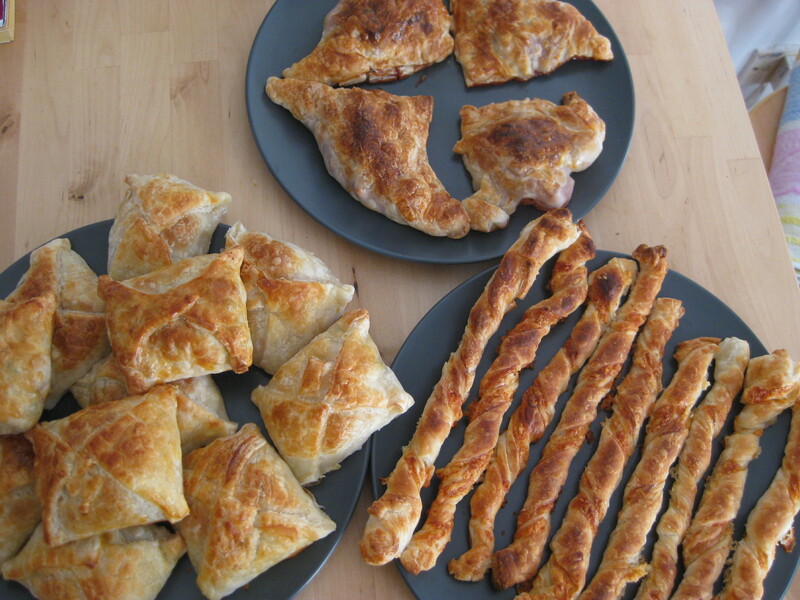 I’ve only tried making puff pastry a couple of times, and found the recipe quite confusing – I think I have a better grasp now of how to do it, but of course, I’m living in an incredibly humid place which doesn’t exactly lend itself to working with pastry. It was hard enough working with the ready-rolled sheets, without bringing all the butter and turning and rolling into the equation. Those are all my excuses for not doing it properly! 1. Preheat oven to 200oC. Line a baking tray with parchment. Put the apples, water, sugar and cinnamon in a saucepan and heat gently for 7-10minutes. 2. 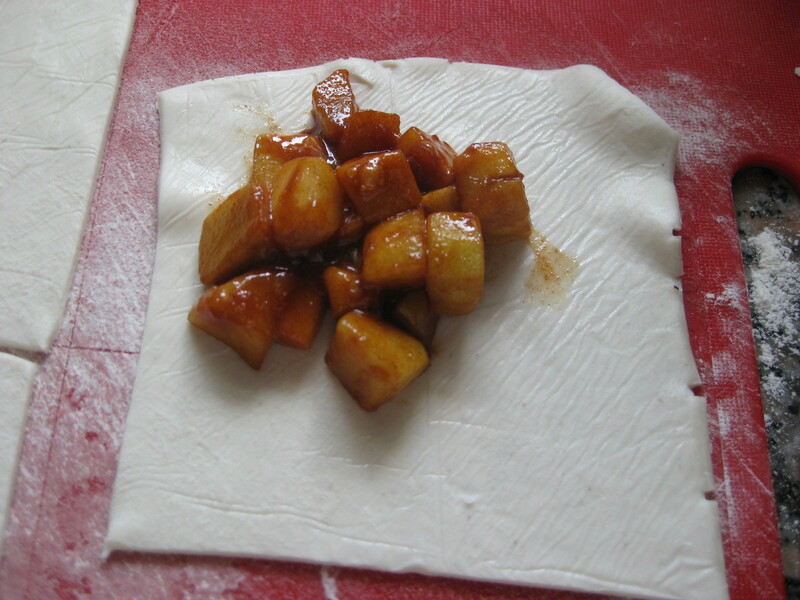 Place the pastry sheet on a lightly-floured surface and cut it into 4 equal square. 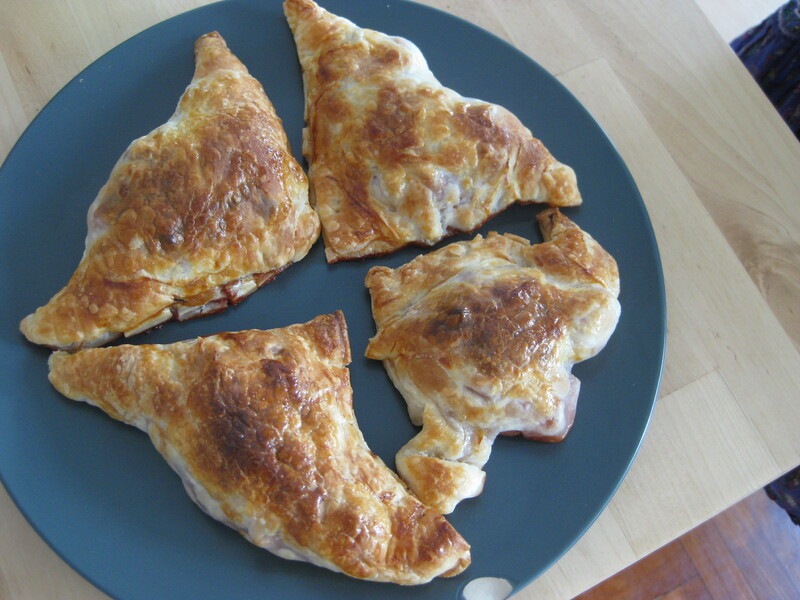 Place a quarter of the apple mix in each square, brush the edges of the pastry with egg, and fold them in half diagonally. Seal the edges well, fluting with a fork as artistically as you like! Brush with egg. 3. Bake in the oven for about 25 minutes until golden brown. I haven’t actually tried one of these yet (that’s discipline for you! ), but they smelled heavenly while they were baking. 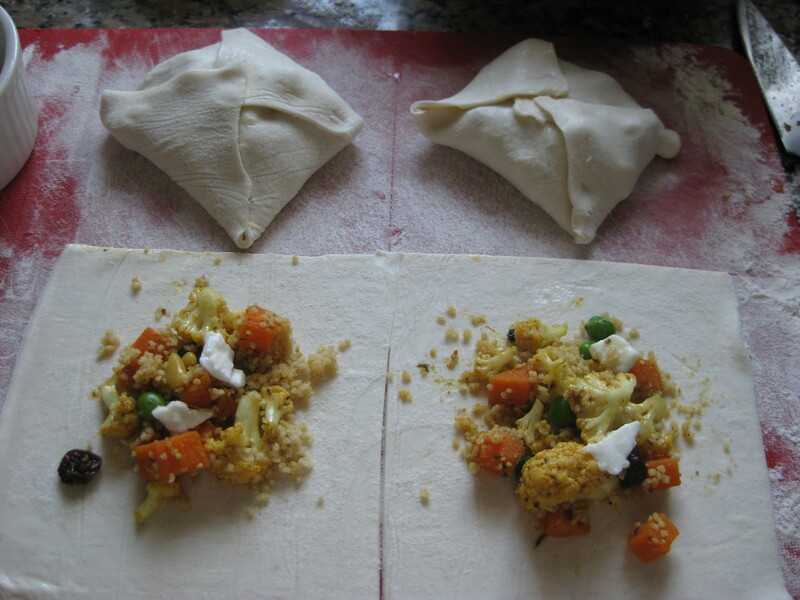 Next up, what I refer to as ‘Couscous envelopes’. Their real, much more glamorous name is Fagottini di Pasta Sfoglia Farcite con Couscous – you will not be surprised to learn, then, that this recipe is actually adapted from an Italian vegetarian cookbook (The Vegeterranean by Malu Simoes and Alberto Musacchio). How they got in there is a mystery though, as they really aren’t Italian cuisine at all but quite a mix of flavours. The recipe is adapted from this rather lovely book which I bought while I was living in Italy last year. 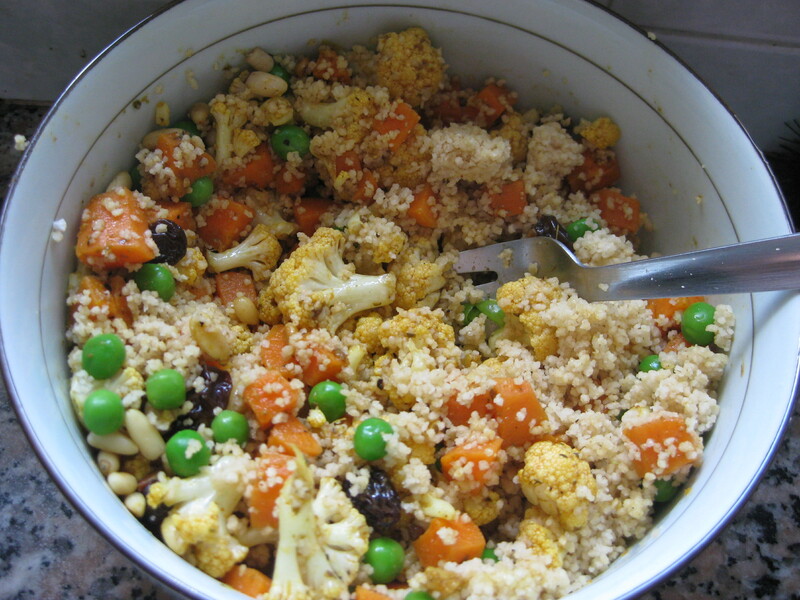 I tend to just use whatever leftover veg I have in – this time, just carrots, peas, cauliflower and a bit of onion. It’s good with all the other vegetables in there too. 1. Preheat oven to 180oC and line a baking tray with baking paper. In a small pan, cover the peas with enough water to just cover, add some salt and a drizzle of olive oil, and cook through over a gentle heat for about 10 minutes. Drain the water and set aside. 2. Heat the butter and olive oil in another pan, and sauté the garlic for a few minutes, then add in the cumin, curry paste and ginger. Throw in the other vegetables too and cook until tender, seasoning well. 3. Meanwhile, pour the hot stock over the couscous, cover and leave for 10 minutes or so until soft. Fluff it up with a fork, add it to the finished vegetables, and stir in the pine nuts and raisins too. Leave to cool slightly. 4. 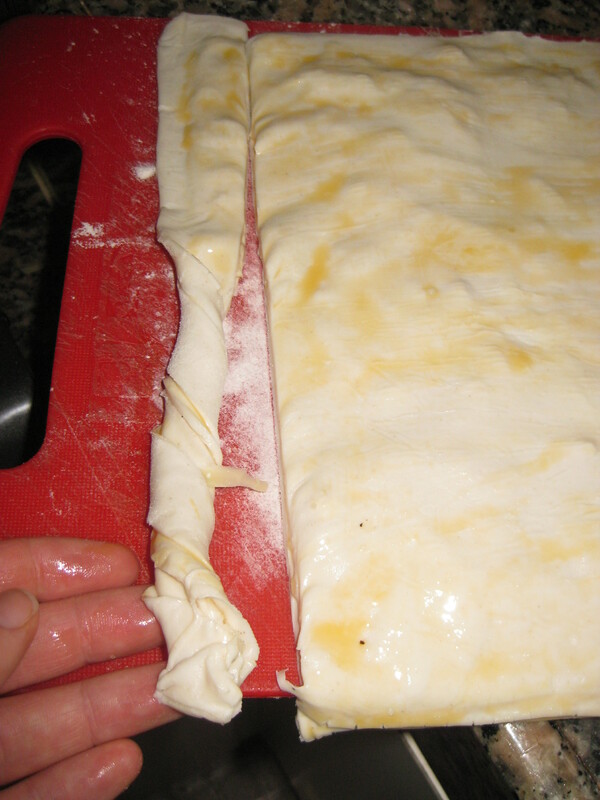 Lay a sheet of pastry on a lightly floured surface, and cut it into 12cm squares. 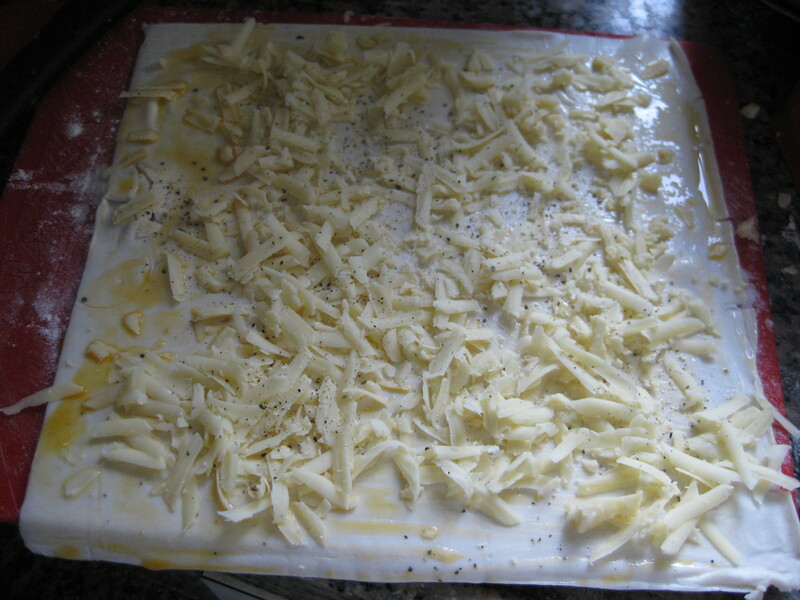 Place 2 tablespoons of the couscous mixture in the centre of each square, add a square of 2 of cheese, and brush the edges of the pastry with beaten egg. Fold up diagonally opposite corners, making a neat little envelope, sealing as well as possible. 5. Brush with more egg wash, place on the baking tray and bake for 20 minutes. These are an absolute treat! 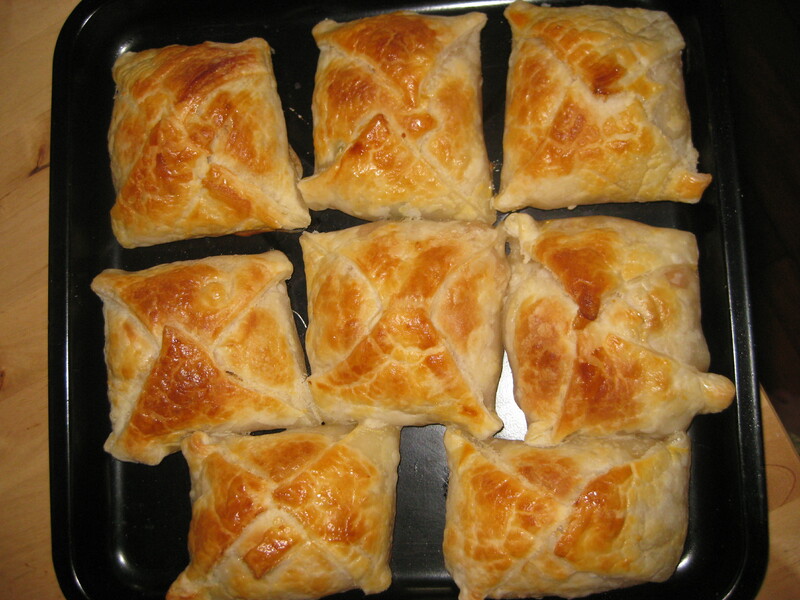 The filling is spicy and healthy, combined with nice crispy pastry…very satisfying indeed. 1. Preheat the oven to 220oC and line a baking tray with parchment. Lay out one sheet of the pastry on a lightly-floured surface and brush it with egg. 2. Scatter over the cheddar and season with pepper. Lay the other pastry sheet over the top, pressing down firmly to seal – this bit was quite sticky and tricky for me – and brush the top with egg. 3. 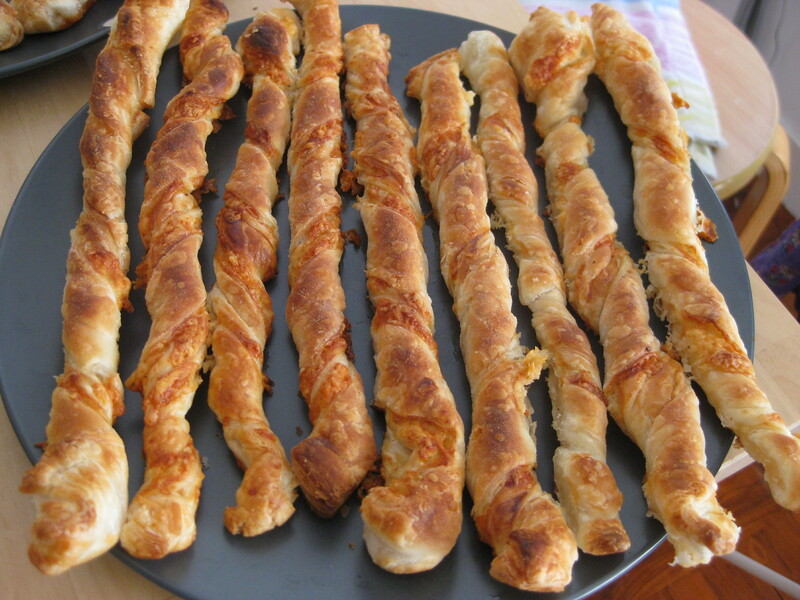 Now the fun part – slice the pastry into thumb-width strips, and twist them round each other. Place them on the baking tray, and bake for 15-20minutes until crisp and golden. The original recipe used sesame seeds too, but I didn’t have any in. I imagine they would work a treat, though. And that was finally the end of all my pastry! That’s enough to satisfy even my obsession. My tiny little freezer is so full, the door can barely close. Maybe I should aim for some healthier food next week, give my freezer and my waistline a break! 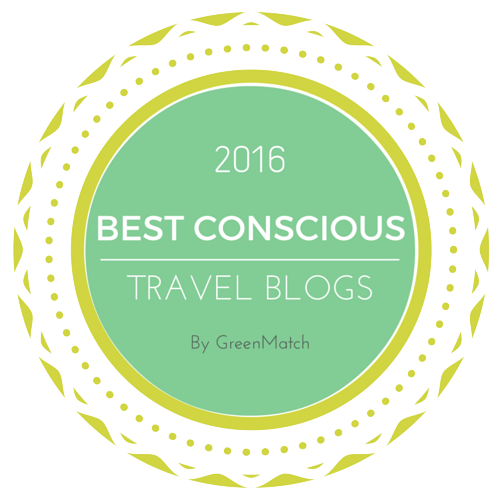 This entry was posted in Vegetarian Recipes and tagged apple, cheese, cinnamon, couscous, Italian, nibbles, pastry, snacks, spicy, treat. Bookmark the permalink.